Domain Admins Access to Private Chat: In this release we have added One of Top Requested Office Chat Features by admins – Access to all private chats in their company. This feature is now available via the Office Chat admin portal to domain admins. 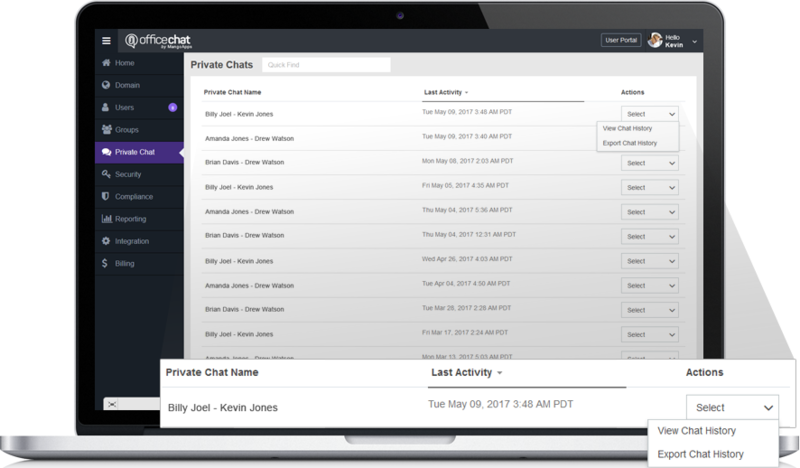 Domain admins will be able to view and export chat history for both private & group chats in their domain. This feature is available on Office Chat Enterprise plan. 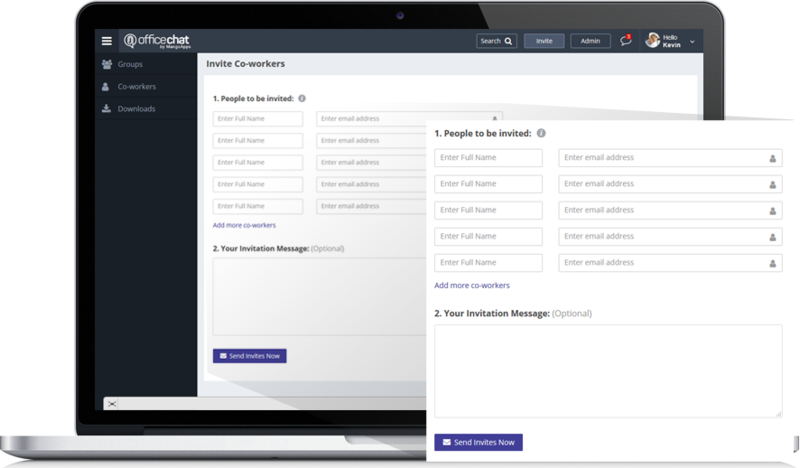 Control Over Inviting New Users: You can control how new users get added to your network. The choices include anyone can invite, anyone can invite but you/domain admins have to approve or only you/domain admins can invite. This feature is available on Office Chat Enterprise plan. Run in Self-Destruct Mode: You can now decide to run your office chat domain in self-destruct mode. Running office chat in this mode will automatically deleted all messages and files shared. 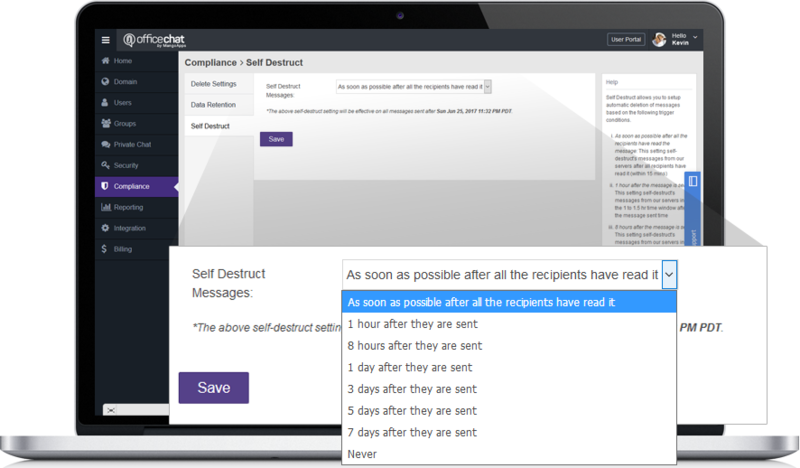 The 2 types of self-destruct settings include automatically deleting messages when all recipients have read it or when a fixed time interval has passed since the message was sent. Please note: Once the messages & files are deleted there is no way for them to be recovered. This feature is available on Office Chat Enterprise plan. 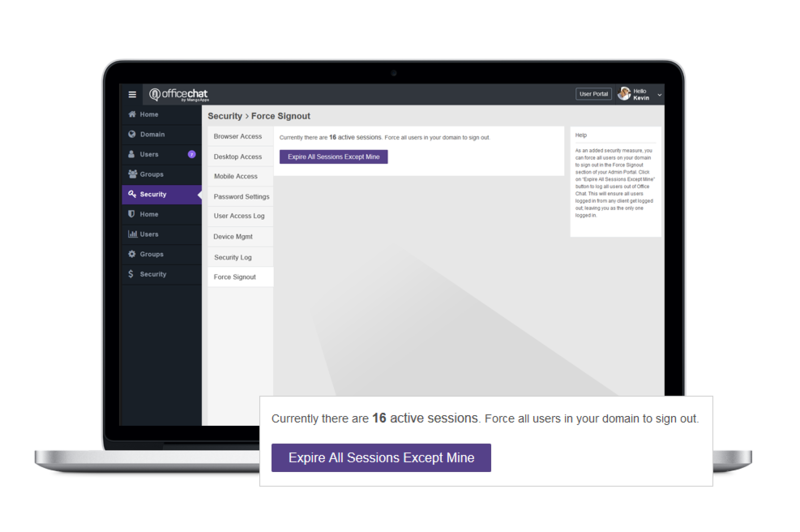 Session Time-Out Settings: Users in confidential environments may need to automatically be logged off when they are inactive, for compliance reasons. With a session timeout period set, your domain will automatically log users out if they are inactive for a set period of time while using the web browser clients. This feature is available on Office Chat Enterprise plan. IP Address Based Access : For additional security and compliance reasons you can now make Office Chat accessible to your employees only from within your company’s private network or over a VPN. You can do this by configuring IP addresses ranges from where your employees can access Office Chat. 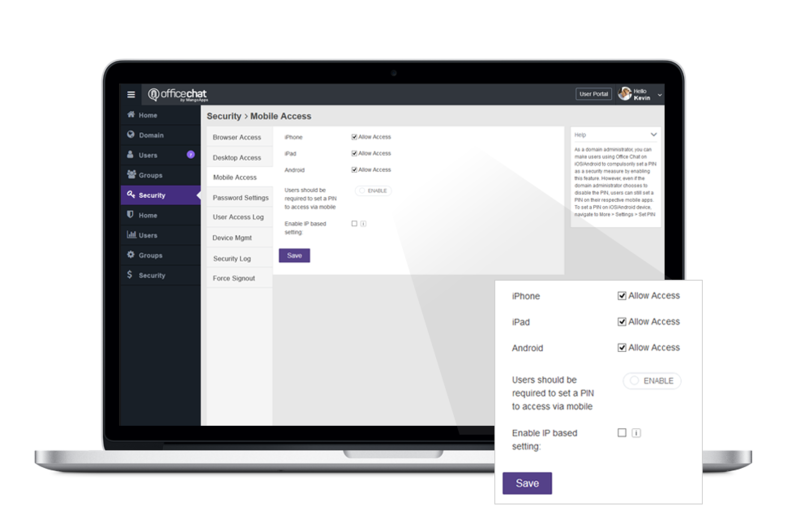 You have additional control to enable the same IP address range to be enforced on users accessing Office Chat from mobile clients as well. This feature is available on Office Chat Enterprise plan. 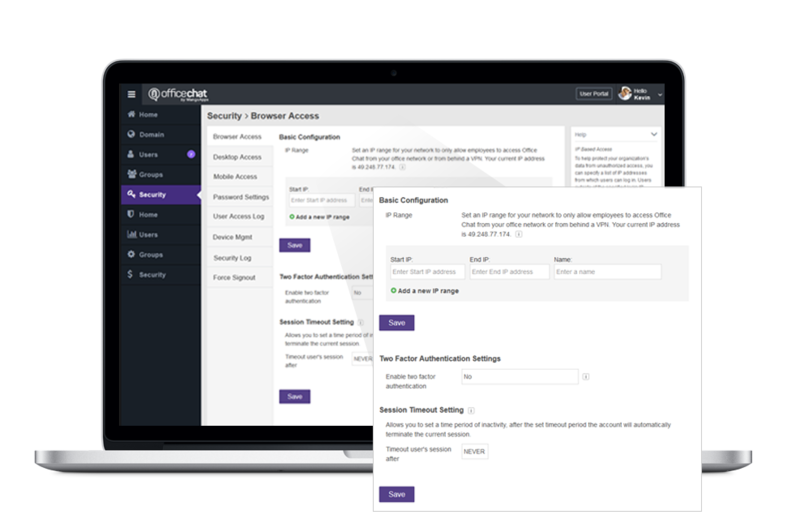 New Logs & Alerts on User Access: Admins would now have access to additional logs from the admin portal. 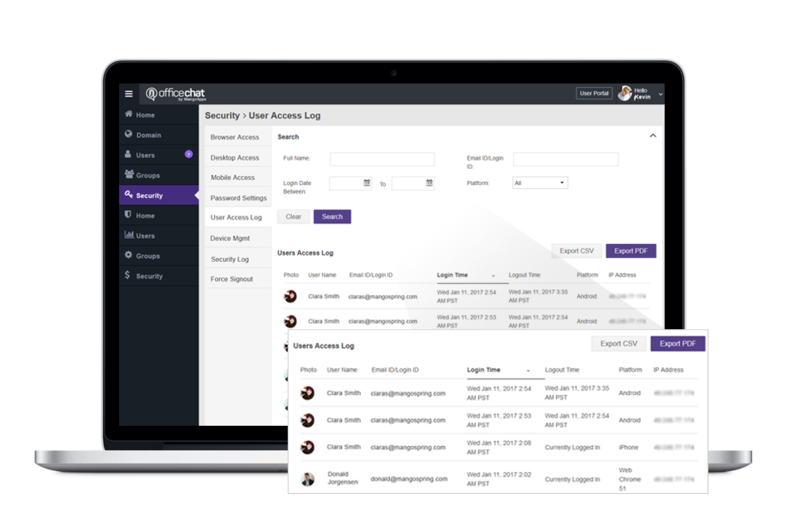 These include the user access log and the security log. These logs would give insight into specific users login history, access from a new geographic location, any un-authorised attempt to access a resource that the user isn’t authorised to view and more. 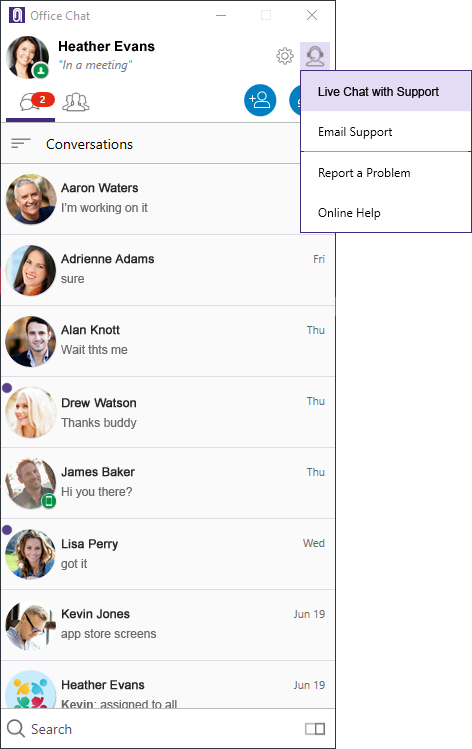 This feature is available on Office Chat Enterprise plan. 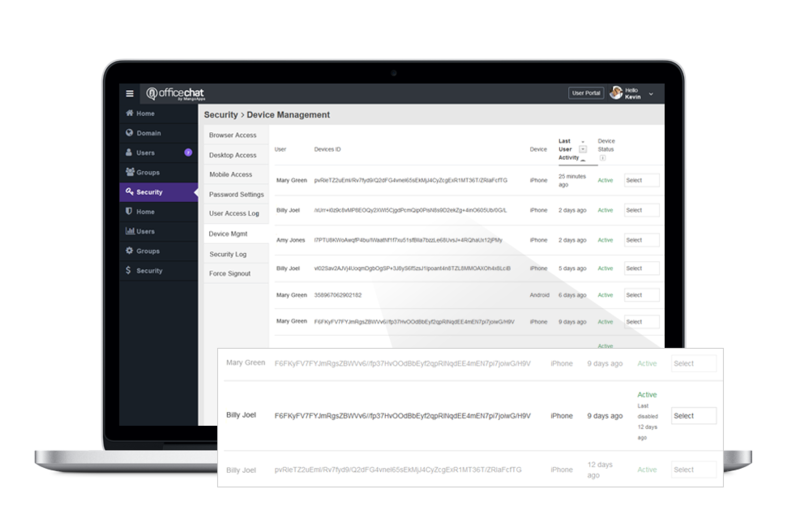 Improved Remote Mobile Device Management: This gives you the ability to do management actions remotely on a iOS or Android mobile device running Office Chat. These management actions include – Wipeout Device and Disable Device. Wipeout device deletes the office chat app downloaded content and Disable device deletes the office chat downloaded content and also dis-allows future logins into office chat from that device. This feature is available on Office Chat Enterprise plan. Enforce PIN on All Mobile Users: You can now enforce all users accessing your Office Chat domain over a mobile device to set a private PIN for additional security. 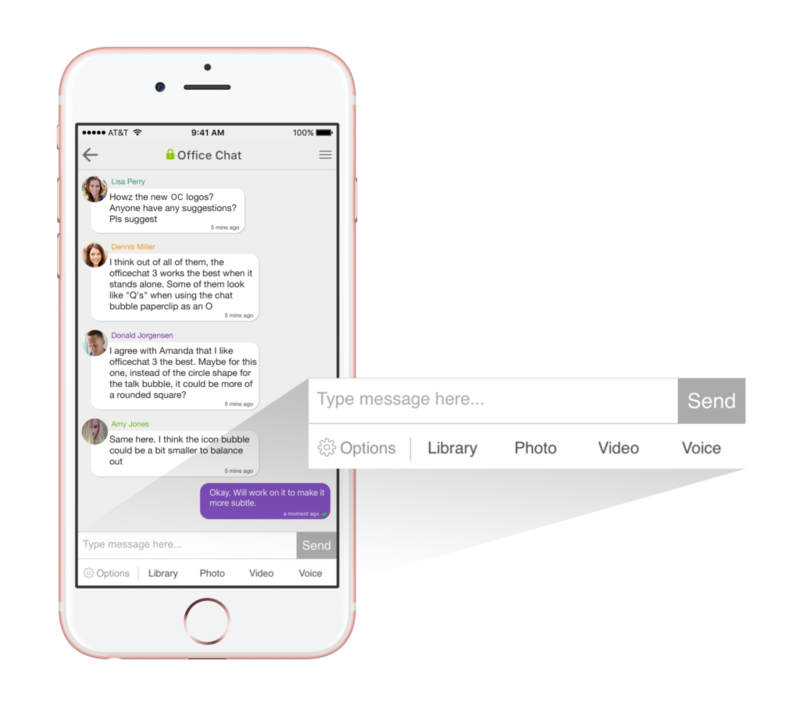 This feature is available on both Office Chat Business & Enterprise plans. Edit User Profiles As an Admin: As a domain admin you can now edit any user’s profile (name, photo etc) directly from the admin portal. 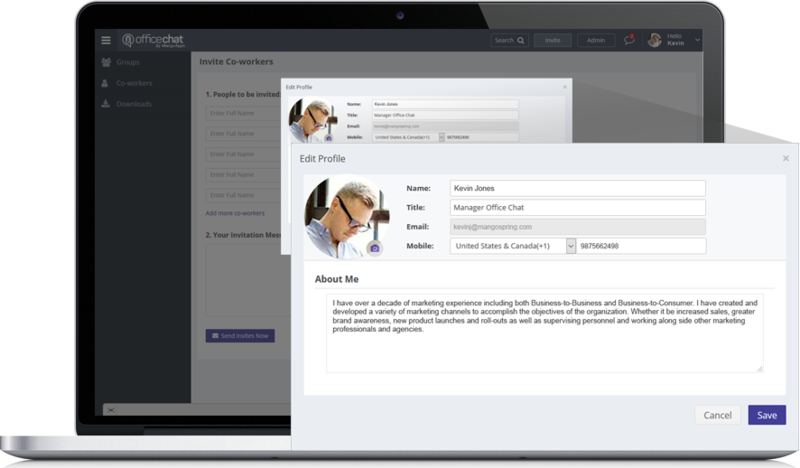 This feature is available on both Office Chat Business & Enterprise plans. Force Re-Login of All Users: As a domain admin you can force all users to re-login. When you perform this action all active users across all platforms of Office Chat will be logged out and will have to re-authenticate. This feature is available on Office Chat Enterprise plan. 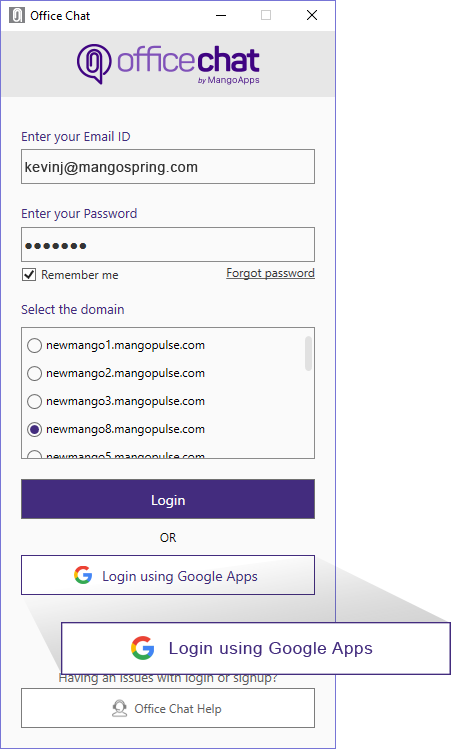 SSO using GoogleApps: You can enable SSO into your domain using your GoogleApps login credentials. This feature is available on Office Chat Enterprise plan. 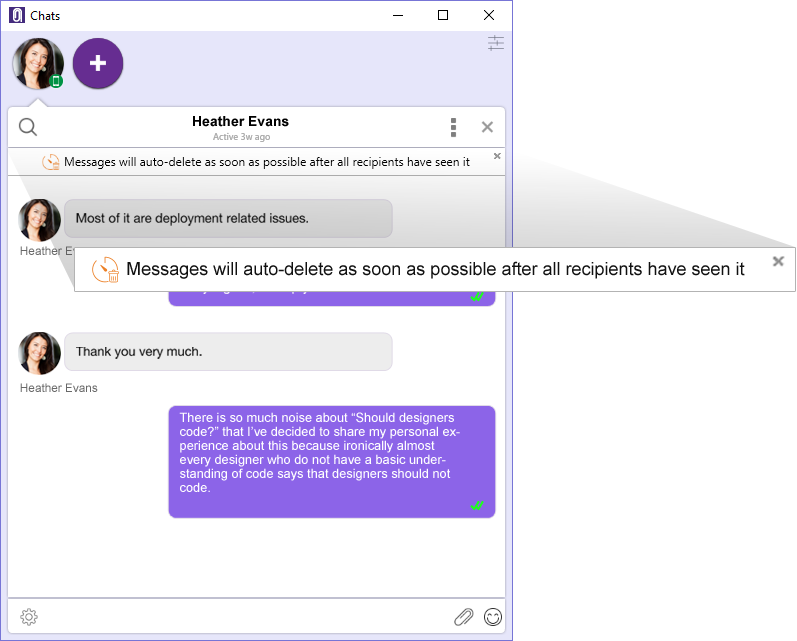 Improved Reliability in Sending Messages: This version of the desktop client has resolved all issues with messages not going after session timeout and connectivity loss to give you a reliable message send experience. 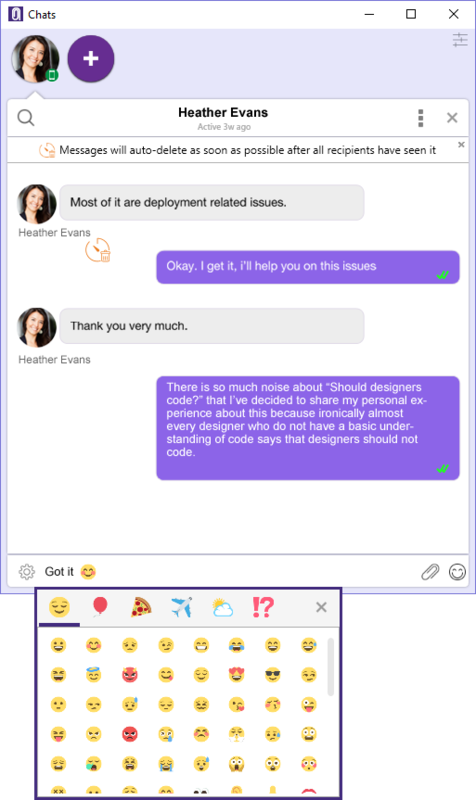 New UI/UX Improvements: Unread filter to get to your unread conversations, new sections for teams and people, auto loading message history, self-destruct message toaster and improved search inside a chat are the new UI/UX improvements added in this release. Addition of Colored Emojis: With this version you can share colored emojis to compliment, express happiness and other numerous feelings in group and private chat. 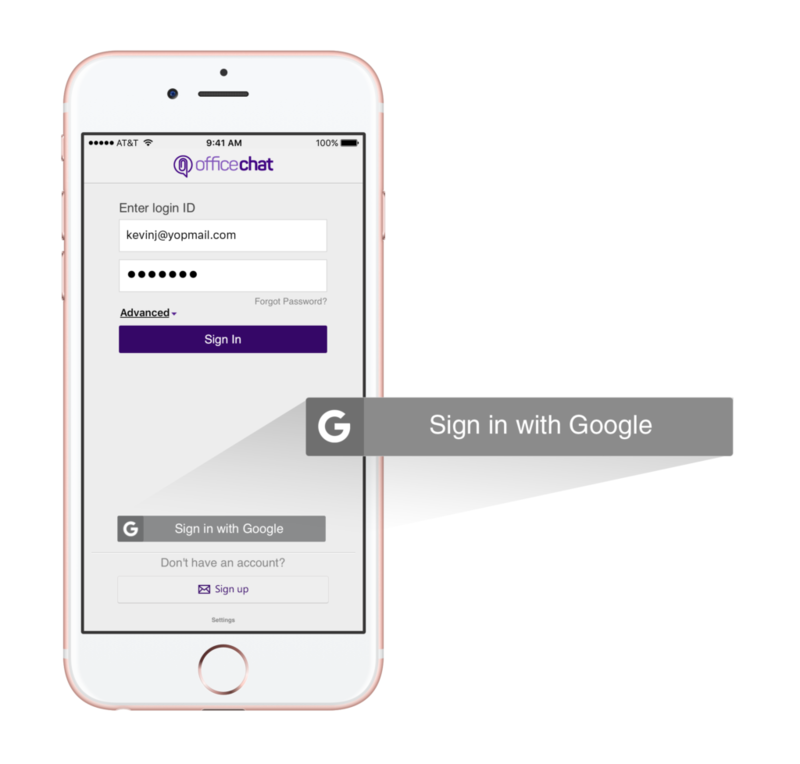 SSO using GoogleApps: If you already use GoogleApps in your company, you can now sign-up and login into Office Chat using your GoogleApps credentials. Administer Domain Access: If you are domain admin of Office Chat, you now have a shortcut to access the admin portal directly from your native client. Live Chat Support Available: We are around to help answer any & all questions you might have on Office Chat. 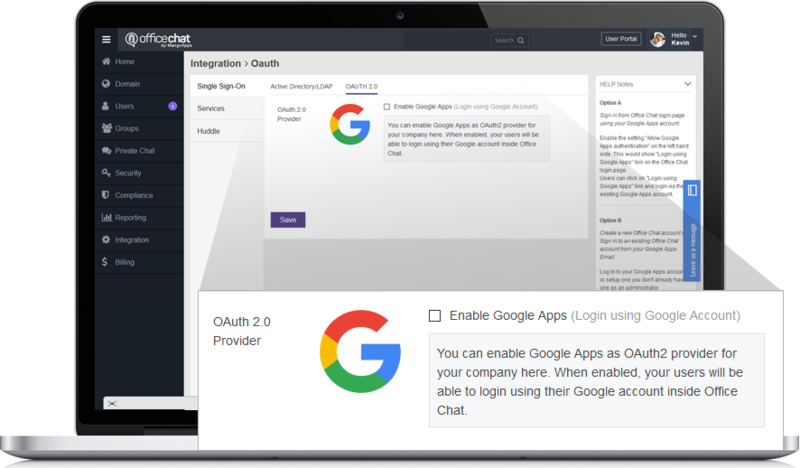 So go right ahead and use the integrated live chat, now available on both windows desktop and mac clients. 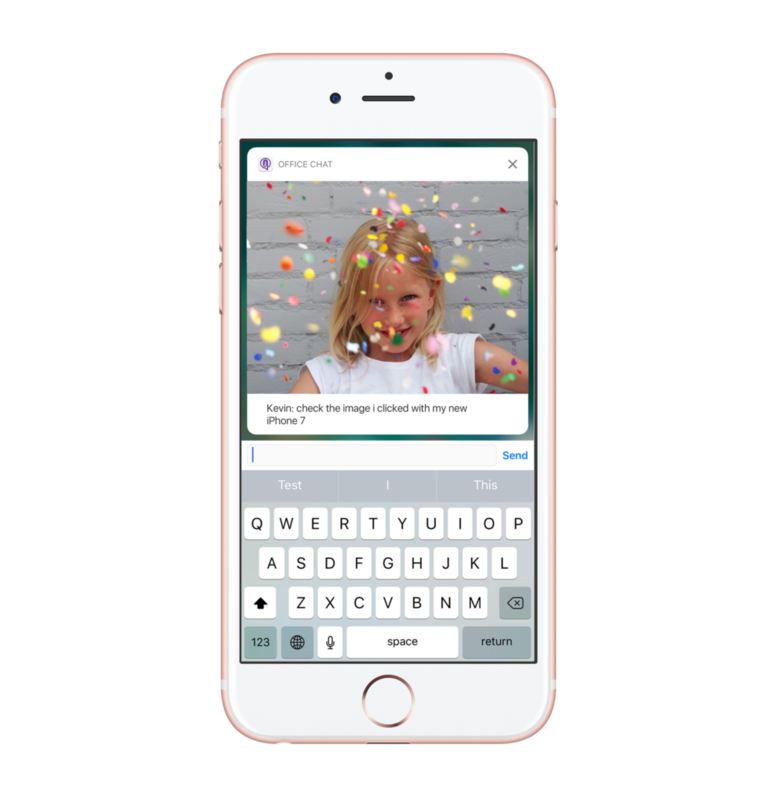 Rich Notifications: Images send in messages can now directly be viewed inline in the mobile notifier which makes opening the Office Chat app not necessary. For iOS app even videos, audios and GIFs are viewable inline in the notifier. UX & Performance Improvements: New notifier when a new message arrives in the chat window while you are reading older messages, improved speed of loading recent messages and a tabbed view of all conversations and unread conversations are the new UI/UX improvements added in this release. 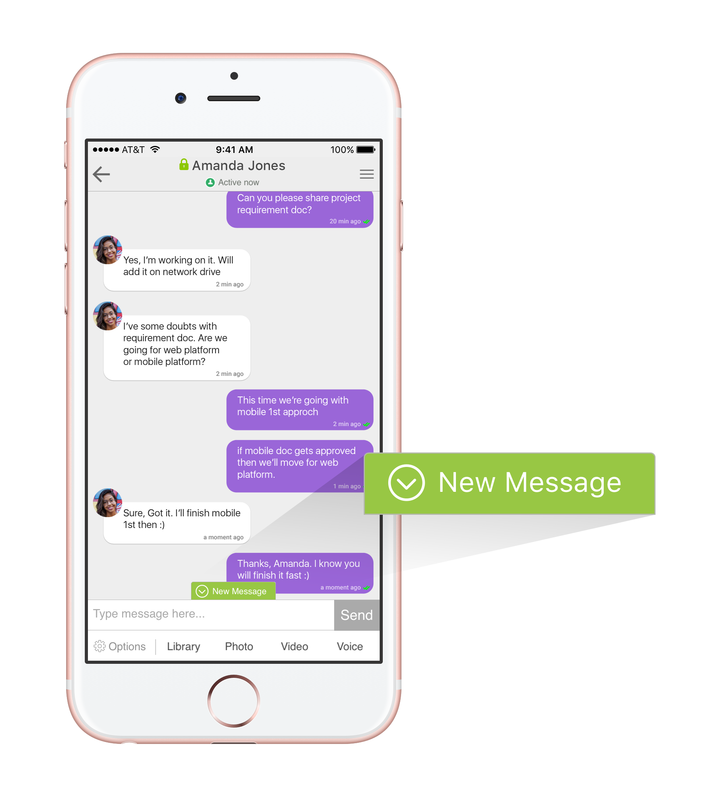 Chat Message Box UX: The UX of sharing images, videos and voice in chat has been greatly improved. 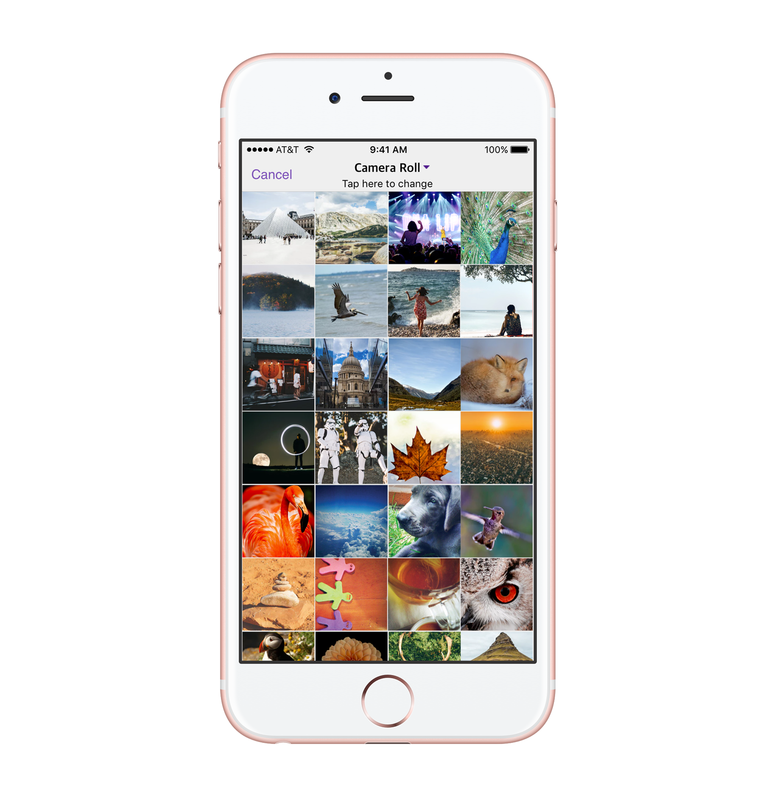 Improved Photo Gallery Experience: Locating and sharing images from gallery has been simplified. 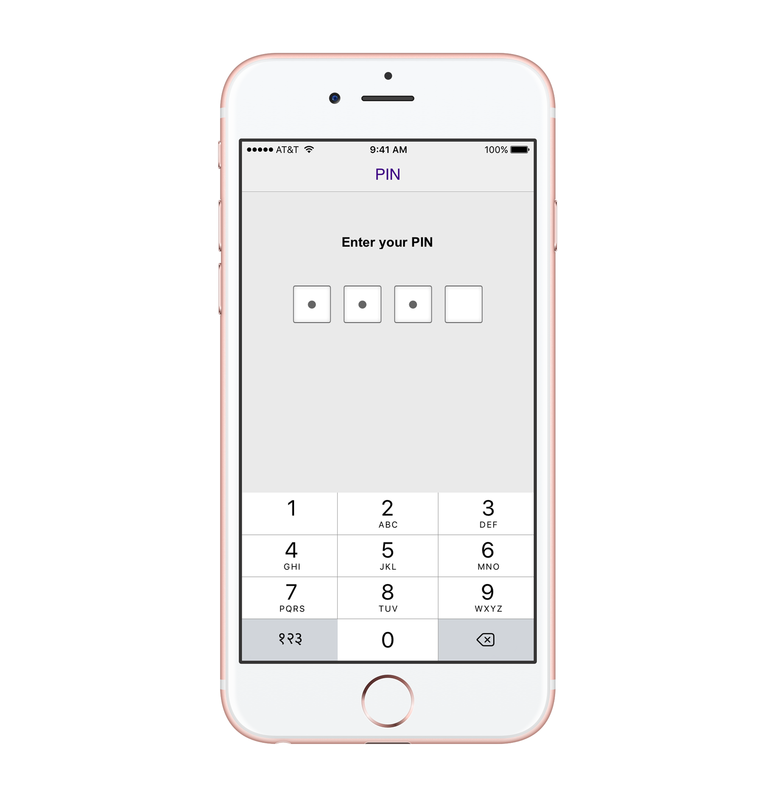 Mobile PIN Support: You can now make Mobile PIN required every time you want’ to access Office Chat app giving you an added layer of protection. 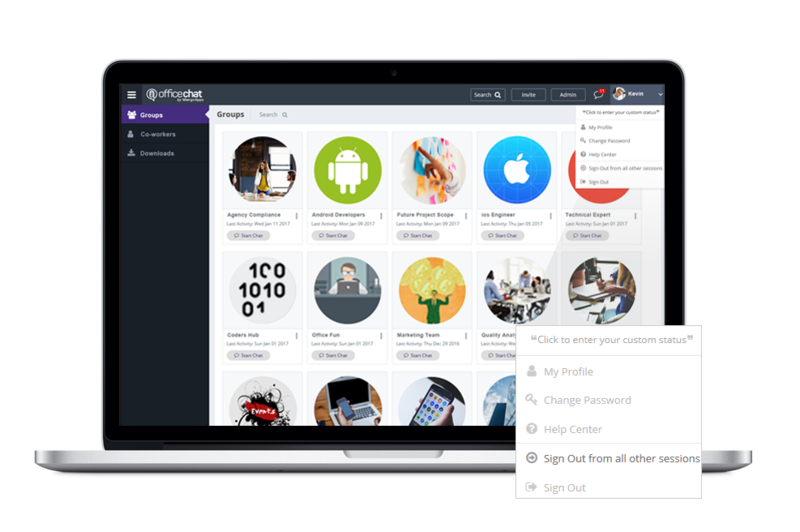 Sign-out from all other sessions: Users now have the capability to log-off from other logged in sessions they might have when they login into the web client. We look forward to receiving your questions and feedback as you start to use these new features & improvements.